With the prediction of a season ending frost coming Wednesday night I will try to head off a question that I’m sure will come up about fruit crops. Question: Should I pick my fruit before the frost? Many hobby orchardists have the mistaken notion that winter apples aren’t properly ripe until they have been frozen. The conditions that result in ripening are cold nights (not freezing) and sunny days. Ripe apples will freeze when the fruit temperature is about 28 F. Once frozen and then thawed, apple tissue will begin to break down rapidly. If fruit freezes on the tree before it can be picked, it may not be a total loss. Wait until the fruit thaws on the tree, then pick and eat or process (juice or sauce) as quickly as possible. If peaches and plums freeze hard, they will break down quickly after they thaw. Apples tend to tolerate freezing somewhat better. A light frost will not hurt apples, but if it gets into the low 20’s they will be alright to eat after they thaw, but the storage life will be drastically reduced. At about 22°F, fruit cell death and damage occurs causing browning and breakdown soon after thawing. If apples are frozen on the surface, do not pick until they are fully thawed to prevent bruising. If browning and breakdown do not show up soon after thawing, the apples have survived freezing, but any freezing causes softening and faster deterioration during storage. Apples that were frozen will not store as long as unfrozen apples. Picking fruit at optimum maturity is the goal. Go by taste and color to determine the best time to pick. 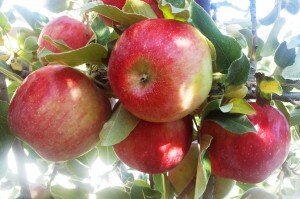 For maintaining quality after harvest, apples should be cooled quickly. Ideally they should be cooled within 24-36 hours after picking. Storage temperatures should be 32°-38°F for most varieties. Most late season apples can be stored from 2-4 months at these low temperatures.Homeowners typically do not have access to controlled temperature storage, so just store them as cool as possible without allowing them to freeze. Having said all that, based on the temperatures that are being predicted in east Idaho for Wednesday night I would pick all my fruit unless they are not ripe, in which case I would just leave them on the tree and hope the weather prediction is wrong.